Good evening, friends! We've had a fairly sleepy weekend, here in Waco. On Friday, I was struck down with an autumnal plague, which has been working its way through Baylor. Other than an outing as the sniffling, water-chugging designated driver at Brew at the Zoo, I've spent all weekend on the couch, drinking tea and keeping Kleenex in business. Not one whit of sewing. Fair warning, I'm watching Harry Potter and have taken a lot of cold medicine today. This may be a rambling post. Grab a warm beverage and settle in! "SQUEEEEE! Tell me you're designing a wrap dress!" 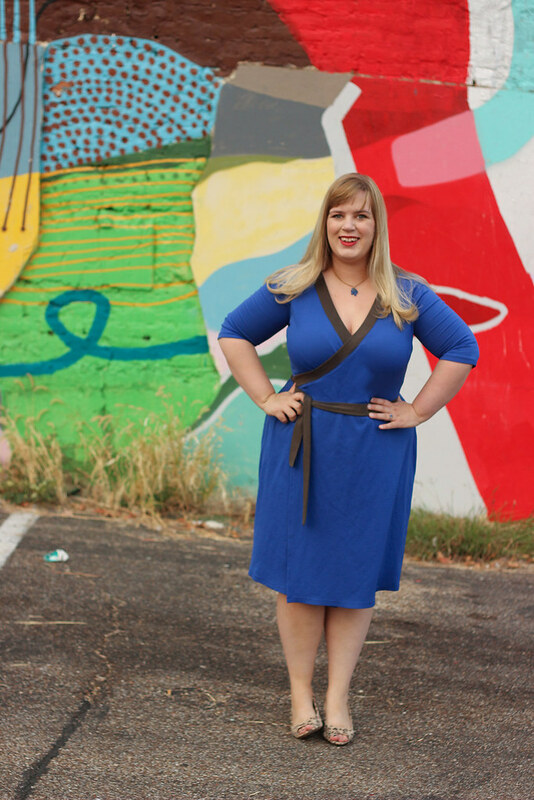 Not only did Jenny end up designing a wrap dress, she designed my platonic wrap dress. Much like my strong opinions on shirtdresses, I have very particular standards for wraps, as well. 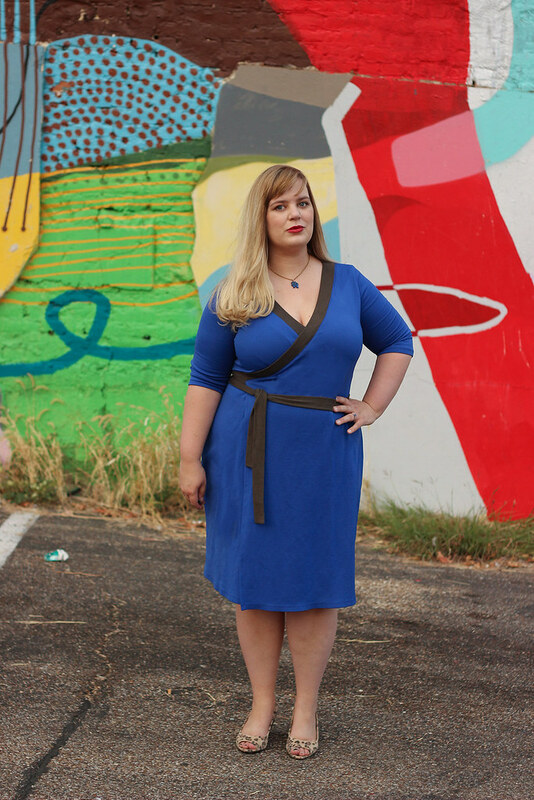 The perfect wrap dress is made from knit fabric, has a banded neckline to prevent gaping, an attached tie belt, and a straight skirt. The Appleton covers all of these points and comes in multiple cup sizes! What's not to love? This particular Appleton dress is one of my tester versions, made up in a double cloth Italian jersey from Mood. 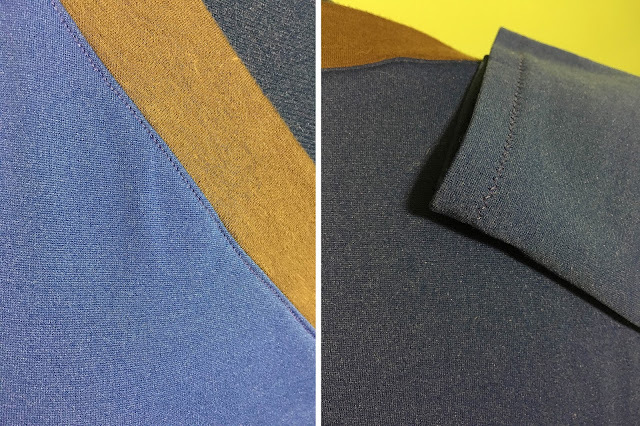 One side is a sapphire blue viscose knit, with the texture of a technical fabric, while the other is a soft cotton jersey in charcoal grey. It has a good amount of stretch (the pattern requires 50%) and excellent recovery. Possibly too excellent, actually. Unlike a more traditional jersey, this one really wants to keep its original size, despite the stretch content. It stretches, but it also contracts and wrinkles, kittens. Thus, things are a bit more body hugging than my usual knit dress or other Appletons. A slip is decidedly necessary, but the dress is worth it. This has been quite the date night hit, around these parts. For this dress, I chose a size 16 G/H, which fits my current measurements of 46-36-46 perfectly. Thanks to Jenny's novel sizing (12-28 plus 3 cup size options), it's best to size the Appleton according to your full bust measurement. How freeing! It takes out all the guess work and the FBA. I found the sizing to be spot-on. While my fabric gave me fits, the pattern did not. Side and back and wind! I was fighting sundown gusts with these pictures--the back does not emphasize my lovely bottom nearly so much, without wind. With a stretchy jersey, as called for, this Appleton fits beautifully. Gone are the armpit wrinkles and gaping necklines of past wraps. I've never felt more secure in a wrap dress! 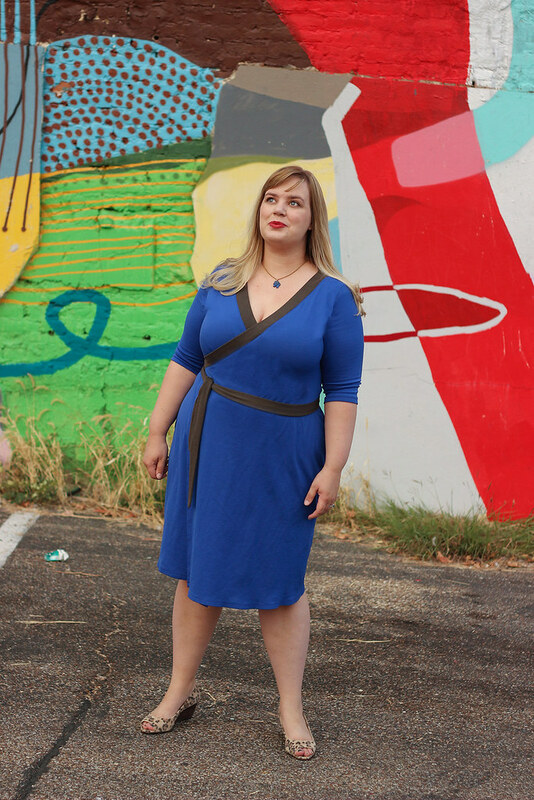 Jenny hired a professional pattern-maker for all Cashmerette designs and it shows in every aspect of this dress. Even in the tester version, everything came together well. There isn't a waist seam, which concerned me a bit, because I prefer a highly defined waist. Since there's such a large difference between my waist and hips, it's really easy for my shape to get lost in fabric. The Appleton suits an hourglass shape perfectly, though, nipping in at precisely the right place and skimming over my lumpier bits. After Jenny received tester feedback, real and important alterations were made to the pattern. 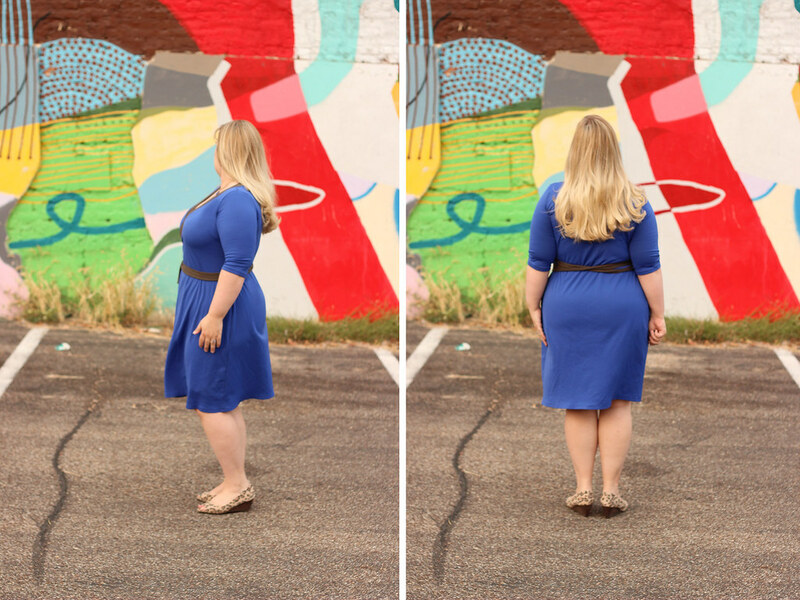 Her testing rounds weren't just to build blogger interest, but to actually beta test the dress. Which is all to say, this isn't an actual review. The pattern you receive, if you've ordered the Appleton, will have an even better fit than this one. When I get my hands on the print copy, I'll make up another version to better review for Idle Fancy. Expect more technical information, at that point. For now, let's talk about construction. On the Appleton, the neckbands and waist tie are joined together at an angle, finishing the dress and providing closures in one fell swoop. This is the only fiddly bit of the pattern, as it requires some spacial puzzling, and is what gives it the "Advanced Beginner" recommendation. If this is your first foray into knits, its quite doable, but I'd recommend getting your feet wet on a simpler pattern first. Because of the control required in adding the neckbands on, I sewed this entire dress on my sewing machine. I'm partial for the lightning bolt stitch, when constructing knit seams, and a very small zig-zag for hems. After sewing each seam, I finished it with my serger. There's no real practical point to this, as knits won't unravel, but it does look nicer. For the last little flourish, I also top-stitched the neckline all the way around, using my edge-stitching foot and heaps of patience. 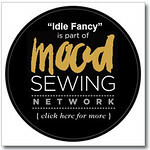 I tend to sew quickly and the care that top-stitching requires always leaves my eyes crossed and my hands reaching for gin. Finally, you may notice that this Appleton closes on the opposite side as the line drawing. This isn't a flaw in Jenny's directions, but personal preference. I had a fairly catastrophic shoulder injury, back in college, and there's one particular angle that still hurts like the devil, despite extensive physical therapy. Threading ties through side seams hits that angle, dead on. To avoid that, for this second Appleton, I flipped things around. I'm sure there are other details I'm forgetting, but my head is stuffed with cotton fluff at the moment. Harry Potter and the Deathly Pillows are calling my name. So, I'll leave you with a link to Gillian's Appleton excellent details post and Michelle's well-reasoned and thoughtful review. As for me, I'll end with this: Well done, Jenny. This is the pattern company I wish had existed, when I began sewing garments again. Everything is carefully thought out and well-designed for the plus size woman, from the expansive size range to the chic, wearable design. 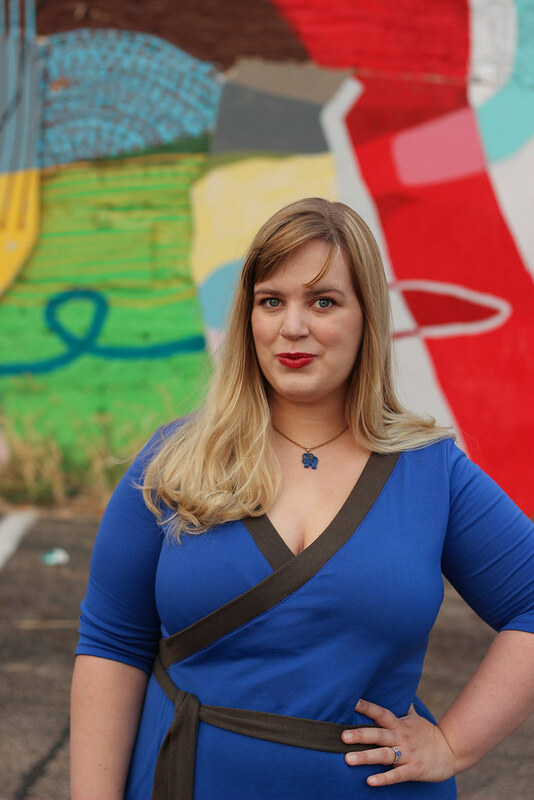 Plus sizes are a niche too long under-served and it's time that changed. I have enough thoughts on the subject to fill my hard drive, but it's easy enough to say I'm thrilled. From the peek I've had at Jenny's future designs, things will only get better from here. Right now, I'm going to put on pajamas and drink some Yorkshire Gold. Enjoy your week, friends! I may trot out my other test versions of the Appleton, in a few days, while waiting for the paper pattern to arrive. Cheers! Note: As part of testing the Appleton dress, the pattern was provided to me free of charge. 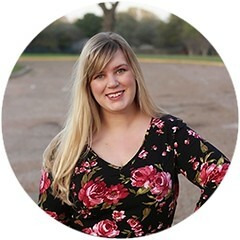 All opinions herein are my own, but you all know that Jenny is one of my closest friends in the sewing community and I have been excited about this pattern for months. Gushing is inevitable.